WIDIAWATI S., NOVITA (2001) Penghayatan beragama dan prasangka rasial (Studi kasus di kalagan mahasiswa Kristen di Universitas Krida Wacana). Skripsi thesis, Universitas Tarumanagara. 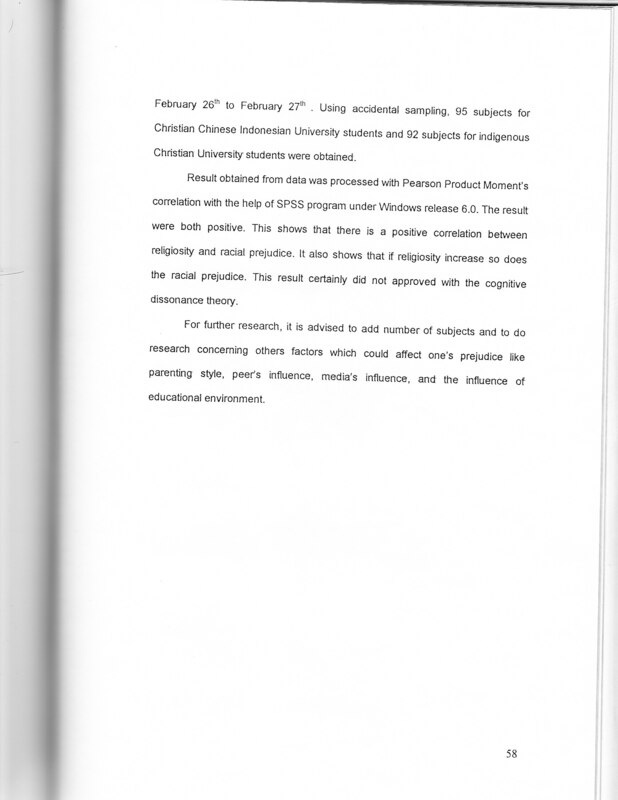 "The problem“ discussed in this research is whether there is a negative correlation between religiosity in the Christian students at the Krida Wacana Christian University or not? Religiosity is a person’s attitude toward religion or the intensity of how far someone take religion seriously, which including cognitive aspect, affective aspect, and the intention to act according to one’s religion, also include religious behavior. Racial prejudice is a negative attitude toward a race and the members of the race. 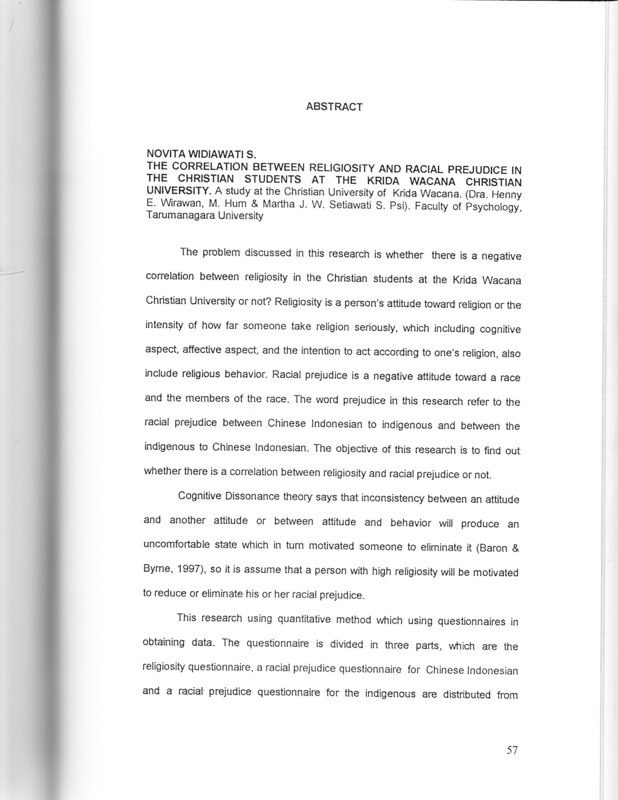 The word prejudice in this research refer to the racial prejudice between Chinese Indonesian to indigenous and between the indigenous to Chinese Indonesian. The objective of this research is to find out whether there is a correlation between religiosity and racial prejudice or not. Cognitive Dissonance theory says that inconsistency between an attitude and another attitude or between attitude and behavior will produce an uncomfortable state which in turn motivated someone to eliminate it (Baron Byrne, 1997), so it is assume that a person with high religiosity will be motivate j to reduce or eliminate his or her racial prejudice. This research using quantitative method which using questionnaires in obtaining data. The questionnaire is divided in three parts, which are the religiosity questionnaire, a racial prejudice questionnaire for Chinese Indonesian and a racial prejudice questionnaire for the indigenous are distributed from February 26th to February 27th . Using accidental sampling, 95 subjects for Christian Chinese Indonesian University students and 92 subjects for indigenous Christian“ University students were obtain-ed. Result obtained from data was processed with Pearson Product Moment’s correlation with the help of SPSS program under Windows release 6.0. The resultwere both positive. This shows that there is a positive correlation between religiosity and racial prejudice. It also shows that if religiosity increase so does the racial prejudice. This result certainly did not approved with the cognitive dissonance theory. For further research, it is advised to add number of subjects and to do j research concerning others factors which could affect one’s prejudice like parenting style, peer’s influence, media’s influence, and the influence ofeducational environment. it. "